Dalmacija charmed the world with its beauties and cultural heritage a long time ago. 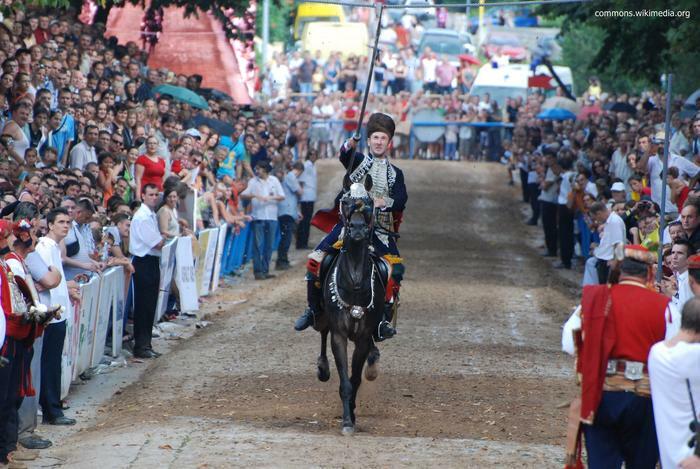 One of its pearls shining for over three centuries is Sinjska alka, a chivalric tournament taking place in Sinj every year at the beginning of August. The town of Sinj and its hinterland have always been known as the land of heroes. The event celebrating this legacy is called Sinjska alka – equestrian competition promoting the spirit of chivalry. Originally Sinjska alka started in 1715 as a celebration of locals' bravery and their victory over the superior army of Ottoman Turks and has continued to this day, marking every first Sunday of August as a special day for all the country. The winner of Sinjska alka receives numerous awards and people of Sinj celebrate him as a hero. Unique feature of Sinjska alka are its contestants called alkari. Dressed in colorful uniforms from the era of the famous victory over Turks, these horseman attempt to aim their lances at a hanging metal ring at full gallop. Their goal is to hit one of the four parts of the ring, but the one who hits the middle part gets the greatest applause and maximum number of points (3). The contestant with the highest number of points wins. Moreover, there are also two smaller tournaments – Bara and Čoja – which are considered to be a prelude to Sinjska alka. They take place two days before Alka and their winners also receive awards and honors, although not as prestigious. Sinjska alka attracts spectators from all over the world. Moreover, in 2010 it was added to UNESCO's List of the Intangible Cultural Heritage of Humanity. So if you plan to visit Split, Trogir or Omiš at the beginning of August try not to miss Sinjska alka and a chance for a really special holiday memory.